Houma, LA, August 3, 2018 — Vandebilt Catholic is set to host its fourth annual Autumn Festival. 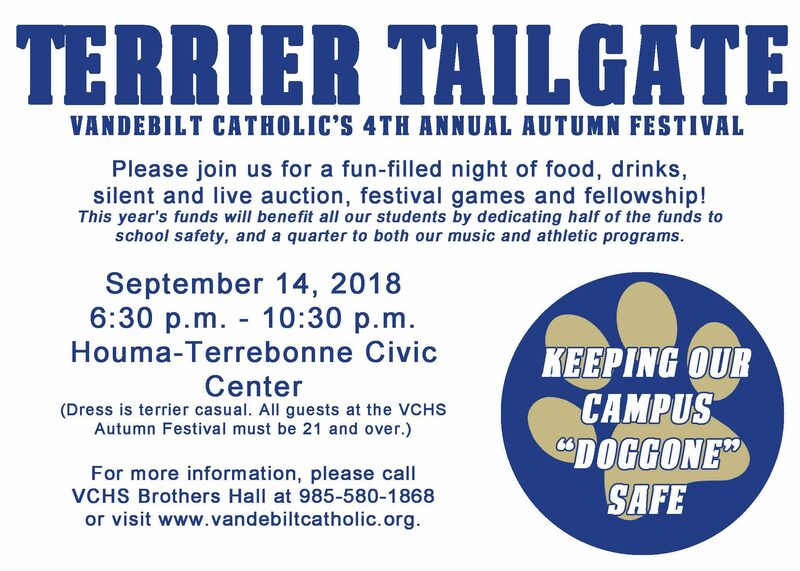 The tailgate-themed format will be set in a “terrier casual” atmosphere with food, drinks, tailgating games and auction, to promote fellowship while supporting our commitment to Catholic education. The event is a major fundraiser for the school and we are excited to share that this year’s funds will benefit all our students by dedicating half of the funds to school safety, and a quarter to both our music and athletic programs. Mark your calendars for Friday, September 14, 2018 and plan to join VCHS at the Houma-Terrebonne Civic Center. Doors will open at 6:30 p.m.
Sponsorships and tickets to the event are available and can be purchased by calling VCHS at 985-580-1868. Tickets are $25 (includes food, beer, and wine) and will also be sold at the door. All alumni, family, friends, and supporters of VCHS are welcome to attend. Guests must be 21 and over. The Terrier Tailgate has become one of my favorite events of the year. It combines the perks of a gala with the laidback nature of tailgating. It’s a perfect evening of casual fun and friendship, all while supporting Catholic education. For more information, please contact Katie Anderson, PR Director at kanderson@htdiocese.org or 985-580-1868.